Today I came across something I had to share! Melissa at Masterpiece Weddings is hosting her first National Fundraiser, in the form of a Wedding Cake competition to support St. Jude’s Children’s Hospital! Chef’s and amateurs alike will have the opportunity to compete before Judges that include World Renowned Pastry Chef’s, and celebrities on their artistic abilities, intricate designs, and taste! 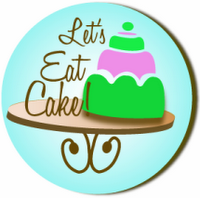 At the end of the competition, spectators will be asked to join in on the fun and taste the cake! I couldn’t be more excited about what an amazing event this is to sponsor such a fabulous organization! They are looking for donations of all sorts to make this event a reality—from decor and volunteers to monetary donations and celebrity judges. Check out their Wish List, to see if you can help! If you’re a fellow wedding blogger, I know Melissa would love it for this information to get passed on to your readers—-perhaps they can help! To learn more about St. Jude’s, click here. It’s May, and as the sun starts to shine, it’s time to think about protecting your skin from the sun, and getting that pre-wedding glow for those wedding pics! If you’re going to hit the tanning bed, now is a great time to get started for your summer wedding. 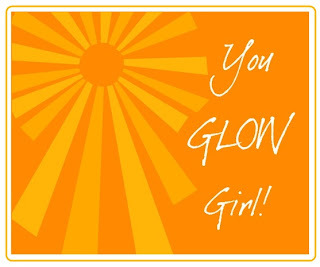 Find a reputable tanning salon in your area that will help you to determine your skin type, and set you up on a gradual tanning schedule that will get you golden without burning you to a crisp! To protect your skin, you can also go with a UV-free option. If you’re thinking about a faux tan for the first time, it can be a little scarey! You’ll want to weigh which option is best for you, from doing it yourself, to getting a professional application. Check out this super helpful article from The Knot, to find out the pros and cons of all of the methods to making you a sun-kissed wedding goddess! Weko Beach is located off of Exit 16 (I-94) in Bridgman, Michigan. The city beach is the little sister of Warren Dunes State Park. It offers a beautiful stretch of beach, along with picturesque walkways and overlooks built into the dunes. 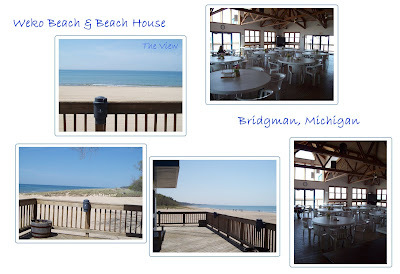 Also on Weko Beach is the beautiful Beach House, which is available to rent for weddings and other events. The building is directly on the beach and has 3 walls of windows facing Lake Michigan. The building is unavailable from Memorial Day to Labor Day. Now you just have to pretend the dune grass is green and beautiful and the trees are full and lush! I get a lot of inquiries from out of town brides (many from the Chicago area) looking for outdoor ceremony sites in Southwest Michigan. Unfortunately, unless you are familiar with the area, or have the time to really do some investigating on your own, outdoor ceremony locations can be difficult to locate for a destination wedding (unless of course you’re headed to a heavily travelled wedding spot such as the Caribbean). Southwest Michigan offers some beautiful options for outdoor ceremonies. 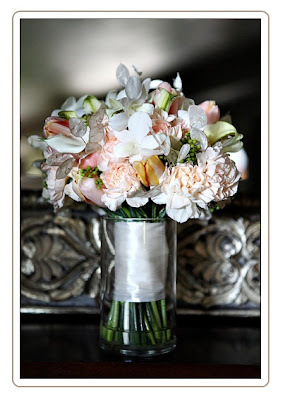 Kelly, one of my most recent brides, is from Chicago, and planning a destination wedding in Southwest Michigan. Since we’ll have limited time to look at venues together, I snapped some photos this weekend of potential ceremony locations. I thought I’d share for any of you planning an outdoor destination wedding in the area! 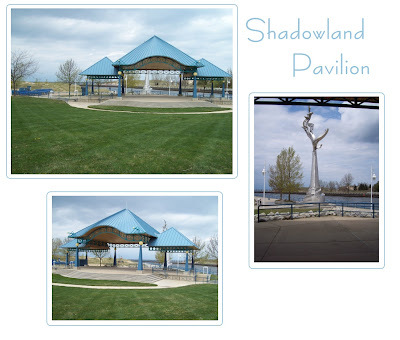 Shadowland Pavilion is just a stones throw away from the beach location shown previously. 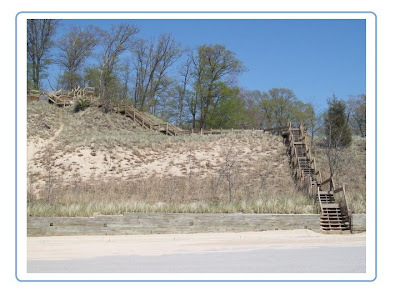 It’s situated on a corner between the St. Joseph River and Lake Michigan. The lighthouse can be seen in the background, and the dunes line the south side. There is even a beautiful sculpture in the backdrop! One thing I love about St. Joseph is that there is sculpture everywhere! There’s at least 6 different pieces along Silver Beach alone! The nice thing about Shadowland Pavilion is that is can be reserved, which means you are free to put up chairs, decorations, etc.! It can be reserved for 1/2 or a whole day, for a fee paid to the city. Also, in the case of inclimate weather, a smaller wedding could be brought up under the pavilion. The John Howard Band Shell is located on the bluff of St. Joseph (the other 2 locations are below the bluff) overlooking the St. Joseph River. The band shell has nice new benches, which means no chair rentals if you’re on a limited budget! Like the Pavilion, the Band shell can be reserved. There is street parking as well as several free parking lots within a block downtown. The band shell is on the edge of downtown St. Joseph, within blocks of all of St. Josephs adorable shops and restaurants. Stay tuned for more outdoor locations coming soon!